As a result of the scale and complexity of the works, there will be some major changes to East Midlands Trains services between 20 July 2013 and 26 August 2013. The full timetable for the period is currently being finalised, however the following changes are expected to take place: - no London services will be able to serve Nottingham station and will instead be starting and terminating at East Midlands Parkway station with connecting replacement bus services. - in addition, services between Nottingham and Skegness will be affected, with services starting and terminating at Grantham during part of the work - other services to/from Nottingham will be affected during the work and details will be confirmed at eastmidlandstrains.co.uk in advance of work starting. Rail Passengers using Manchester Victoria are to benefit from a new lift and other facilities that will help increase access to the station as, Rail Minister Norman Baker has today announced. Under the Coalition Government’s Access for All scheme, £1 million will be used to provide a new lift to the footbridge, ensuring level access across the station. The money would also fund new handrails and landings on the existing footbridge. The work at Manchester Victoria is expected to start on site in January 2013 and will take around 16 months to complete. The work will help turn the station into a better transport interchange, which will benefit from increased patronage from the Metrolink extensions currently being constructed. Members of Northern Rail’s Rail Response team stood side-by-side with colleagues from the British Transport Police and First TransPennine Express recently as they took part in a pub crawl with a difference. Officers were keen to deliver a firm but fair message to remind everyone on the route, both regular passengers and Real Ale Trail patrons, to travel safely and sensibly. The Trail winds its way through several rural stations throughout the Northern and TransPennine Express network, including Slaithwaite, Marsden, Greenfield and Stalybridge, with pubs nearby serving top quality ales to visitors keen to drink in the atmosphere. Its growing popularity has made it well known to ale fans around the country and although many travel from local cities such as Leeds, Manchester and Huddersfield, visitors also make the trip from all over the United Kingdom. Billy Vickers, Police Liaison Officer for First TransPennine Express said, "The Real Ale Trail is a fantastic event that is enjoyed by many customers on a regular basis. Travelling by train is a safe and hassle way to enjoy the festivities in the villages and towns along the route. Unfortunately a very small number of people consume too much alcohol and their behaviour becomes threatening and anti-social. First TransPennine Express will not tolerate such behaviour and will work with British Transport Police, other rail operators and the local publicans to ensure that all rail customers and staff have a safe and comfortable travel experience." Far-reaching work to cut tube delays by 30 per cent by 2015 was highlighted on 20 July 2012 by Mayor Boris Johnson. The delay-busting plan will build on last year's best ever Tube performance results and was a key election manifesto commitment. Plans now being developed in detail involve TfL looking into every aspect of how the railway is operated, maintained and upgraded to see how things can be done differently to further improve reliability, and to reduce annual lost customer hours by a further 8.7 million hours between now and the end of 2015. * The Tube’s Emergency Response Unit vehicles now responding to incidents under blue-light conditions. This has reduced average response times in central London by 40 per cent to 12 minutes. Staff numbers at the unit have been increased by 30 per cent, with the number of depots housing Emergency Response Unit crews increased from three to four. * Fitting of covers to Passenger Emergency Alarms on trains on the Jubilee, Northern, Piccadilly and Victoria lines, helping to prevent accidental and malicious use. * The establishment of two new signaling depots at Oxford Circus and Stratford, to optimise LU response to signal faults on key Olympic lines. * Investment of £1m to train British Transport Police officers in providing medical help quickly where customers are taken ill on the network, enabling services to resume quickly. * The development of an Automatic Track Monitoring System on in-service Tube trains, to monitor and identify where rails need remedial work or closer inspection. * Large-scale modifications to boost the reliability of components on doors, couplers, seats, and air systems on the Tube fleet. Using sophisticated analysis to identify the parts of the railway most important to improved reliability, classifying them as “golden assets” and developing dedicated asset management regimes to improve them and thereby drive up performance. Standardising the train fleet and signaling wherever possible. For the first time LU is able to commission the same trains and signaling on the four Sub-Surface Railway lines (the Circle, District, Hammersmith & City and Metropolitan lines), which will lead to improved reliability as well as reduced costs. Launching the biggest track renewal programme in decades to deliver more reliable track and signaling performance. Reviewing the capital programme and the Underground's contracts with suppliers to ensure reliability is at the core of LU's capital investment and contracts. Utilising the latest Wi-Fi technology to communicate train performance to technicians in real time, allowing them to respond more swiftly to any problems. Providing further intensive training to equip frontline staff with the basic skills to respond to the most common problems as they happen, enabling a faster response. Increasing the number of apprentice places in key parts of the business by 50 per cent, in order to increase over time the number of skilled engineers looking after the network, improving incident response levels. More first aid training for frontline Tube staff to complement LU’s training of BTP officers up to medic level. By knowing how best to respond to someone who is ill on a train, staff can improve service reliability by taking the right action to get help for the individual while getting services moving again for the many thousands of customers on following trains. Setting, communicating and tracking annual 'lost customer hours' targets for each part of the business for the first time, including targets for each line. Setting up an ongoing communications campaign with passengers to help them understand the impact on delays of actions such as dropping litter and blocking doors. Conducting an in-depth review of track layout to increase reliability and reduce delays by, for example, reducing the number of individually-designed points and crossovers so that there are fewer parts with unique maintenance requirements. Working with suppliers to set out specifically the improved level of reliability we expect from a new piece of equipment or system. For the first time, suppliers will be required to demonstrate prior to installation on the network that the equipment will deliver that level of reliability. In addition, focus will be maintained and increased on specific initiatives for each Tube line, tailored to whether they have been recently upgraded or are using ageing equipment. For example, on the Victoria line, work has already been undertaken to fix teething problems with train doors and to enable maintenance staff to remotely monitor the trains’ systems using Wi-Fi. This allows staff to take real-time decisions on whether to take a train out of service to prevent more severe delays from occurring. A range of further improvements will be made to the Jubilee line fleet after the Games, including modifications to gear and brake systems, as well as the Northern and Piccadilly line fleets. Detailed plans are now being drawn up, with the full programme to be published in November. From 23 July 2012, buffet cars on the mainline between Norwich and London Liverpool Street will take on a patriotic look with Union Jack bags and themed posters to promote five exciting meal deals. The ‘Gold’ deal featuring a slice of Sponge cake, any ‘themed’ sandwich, tea or coffee, and any crisps for £5.95. The ‘Bronze’ deal offers any snack box, with any can of soft drink for £4.50. Greater Anglia will also offer a Bacon roll with Tea or Coffee for just £4.70 and Shortbread with Tea or Coffee for just £2.50. East Coast has teamed up with crime author Julia Crouch to become the UK’s first writer-in-residence on-board a train. The train operator worked with Julia to create a short story, Strangeness On A Train, written on-board its train service between London and Harrogate, which will be published as a free e-book available to download from Apple or Amazon.co.uk on Thursday 19 July. The launch of Strangeness On A Train coincides with the start of the 10th Theakstons Old Peculier Crime Writing Festival in Harrogate, which runs from 19 to 20 July, and is sponsored by East Coast. Strangeness On A Train, published by Headline Publishing Group, is a dark compelling story, which reveals what happens when one passenger pushes a fellow female traveller beyond her limits. As well as the journey itself, Julia was heavily influenced by the rich heritage of crime fiction set on trains including Patricia Highsmith’s Strangers on a Train, Agatha Christie’s Murder on the Orient Express, and 4.50 From Paddington. Julia, will appear at this year’s Theakstons Old Peculier Crime Writing Festival on Sunday 21 July as part of a panel discussion entitled Deadlier Than The Male. This will consider whether women in crime fiction are more graphically violent. Julia will publish her second novel Every Vow You Break on 2 August. For further information about travelling to Harrogate with East Coast, visit: www.eastcoast.co.uk. Summary: At about 13.52 hrs on 24 August 2011, an elderly pedestrian was struck and fatally injured by a train on Gipsy Lane footpath crossing, near Needham Market in Suffolk. The train driver said that he had seen a person on the crossing, but not on the line on which the train was approaching, and that when he sounded the train’s warning horn the pedestrian continued to cross and was struck. Although it is not possible to be certain why the pedestrian continued to cross into the path of the approaching train, the RAIB considers that she either did not see it, misjudged the speed of the approaching train, or was unclear about which line the train was approaching on. During its investigation the RAIB observed that: for elderly and other vulnerable users, the warning of an approaching train was not sufficient to enable them to use the crossing safely; in the period up to May 2011, no action was taken to address the risk to vulnerable users, mainly because data on level crossing usage and measurements taken as an input to risk assessments were often inaccurate; no short-term mitigation measures were implemented when it was identified in May 2011 that the whistle board was not providing adequate warning to vulnerable users of the crossing, or in June 2011 and August 2011 when further visits by Network Rail staff confirmed that there was insufficient warning; and Network Rail’s guidance to staff making decisions about applying short-term mitigation at level crossings where warning times were insufficient sometimes had the effect of discouraging those involved from taking action. Recommendations: As a consequence of this incident, the RAIB has made four recommendations to Network Rail. These cover: improving the safety of pedestrians crossing the railway at Gipsy Lane; making sure level crossing data is collected accurately and consistently; developing guidance on short-term mitigation measures at level crossings that have insufficient sighting or warning of trains; and making enhancements to the cost-benefit tool that is used to assess level crossing risk mitigation measures. First Great Western has announced it will trial free Wifi on trains running between Paddington and the Cotswolds, allowing passengers to check emails and browse the internet on their own Wifi-enabled devices. The technology will be installed on five Class 180 trains, 25 vehicles, which will upgrade the current fleet running on the line, as part of a series of reliability and comfort modifications. Wifi is also available at a number of FGW stations through the public provider The Cloud. A West Highland woman has become the first person in Scotland to have single-handedly transformed three stations as part of ScotRail’s Adopt a Station community project. Sonia Cameron has installed six half-barrel planters at Morar, adding to the floral displays she plants and maintains at Mallaig and Arisaig. ScotRail has paid tribute to the Mallaig resident’s success in enhancing the stations on the world-famous West Highland Line. Sonia’s planters and hanging baskets helped Mallaig station win gold accreditation in Keep Scotland Beautiful’s Tidy Station Standards awards last year. She also looks after the station building at Britain’s most westerly mainland station at Arisaig for HITRANS, which uses it as an office and meeting-room. Sonia is also the rail correspondent for monthly magazine West Word, which is based in an office at Morar station. ScotRail has unveiled a new poster at North Berwick station recalling the ups and downs of the area’s railway history. The poster describes how the North Berwick Line has evolved from a Victorian steam railway to a modern commuter and leisure route. It has been designed by North Berwick in Bloom, which cares for the station’s award-winning garden as part of ScotRail’s Adopt a Station project. Sheila Sinclair, of North Berwick in Bloom, said: "The station is very special to us, and we wanted to tell the story of our railway to visitors who arrive by train." John Yellowlees, ScotRail’s external relations manager, said: "North Berwick in Bloom does a great job keeping the station looking good for everyone who uses it. “We are delighted to be able to display its poster telling the area’s eventful railway history." Passenger steam trains were launched on the North Berwick line in 1850, but were replaced just four years later with a horse-drawn single-carriage tram to cut costs. By the 1920s, railway was booming as the town’s reputation grew as a scenic golfing and seaside holiday destination. However, a successful campaign was needed to save the line from closure in the 1960s and, even then, only limited services ran during the 1970s. The North Berwick line has enjoyed a revival in the last few decades, including electrification and – last year – the introduction of Britain's newest type of train, the Class 380. The poster draws on research by Edinburgh historian Andrew Hajducki QC, author of The North Berwick and Gullane Branch Lines. National Express train operator c2c completes the refurbishment of Thorpe Bay station, with the new-look station officially reopened by local MP James Duddridge on 18 July 2012. The new balcony will provide passengers with a wider choice of places to eat and shop with an extra 20,000 sq. ft. of retail space. The new brands opening at the station are Yo! Sushi, Fat Face, Hotel Chocolat, Oliver Bonas, Links of London, Thomas Pink and new-to-station brand Joules. Further additions will include Italian eatery, Carluccio's, Kiehl’s Sports Bar & Grill, Benugo and Corney & Barrow’s new concept bar The Cabin, which will be opening soon. Once all the new units are open, the retail capacity within the station will total 55,000 sq ft across 38 stores. All of Metrolink's oldest trams will be replaced with new vehicles by 2014, in a move that will lead to significant improvements for passengers. Transport leaders agreed to replace 12 of the 32 original 'T68' trams with the M5000 vehicles in September last year - and they have now agreed to replace the rest. An order for 20 new M5000s will now be placed with a consortium of tram manufacturer Bombardier and propulsion supplier Vossloh Kiepe. The decision, approved by the Greater Manchester Combined Authority, means that, when the order is complete in 2014, all services on the Metrolink network will be served by brand new vehicles. The Transport for Greater Manchester Committee will oversee the investment on behalf GMCA. Bombardier and Vossloh Kiepe are already supplying 74 new M5000 trams to serve the existing and expanding network - with new lines to Rochdale train station, Droylsden & Ashton-under-Lyne, East Didsbury, Oldham and Rochdale town centres and Manchester Airport & Wythenshawe all well underway - and to replace 12 of the T68s. Councillor Andrew Fender, Chair of the TfGM Committee, said: "This decision signals the end of one chapter for Metrolink and the start of a new one. Our T68 vehicles were the first of their kind in the UK and served the first modern light rail network of its kind in the country. "The arrival into service of our first new vehicles in December 2009 demonstrated just how far the industry has come in that time and it is clear that our T68s no longer live up to the standards that passengers expect. The time has now come for them to enter a well-earned retirement. The new Bombardier trams have delivered significant improvements for passengers and I'm sure regular users of the network will welcome this announcement and the benefits it will bring to the services they depend upon." A total of 26 T68s served the original line - Altrincham to Bury - and a further six came into service in 2000 when the Eccles line opened, taking the total fleet to 32. The first new M5000 entered service in December 2009. Following the launch of the South Manchester line to Chorlton and the expansion to Oldham Mumps, around 25 M5000s are now in service on the network every day - just over half the in-service fleet. Once all the new lines are in operation, the network will be served from a pool of 94 new M5000 trams. The M5000s are up to four times less likely to develop a disruptive fault than the T68s, which reduces maintenance costs. As they are 10 tonnes lighter, they will also reduce energy costs and prolong the life of existing rails by several years, which will reduce the long-term costs of track renewals and prevent greater disruption for passengers. The phased 'retirement' of the T68s began in September 2011, with the order to replace an initial 12 vehicles. This initial phase should be complete by the end of summer this year. A plan to phase out the remaining T68s and introduce the new M5000s will now be developed with the operator, MRDL. From Friday 8 June 2012. First Capital Connect (FCC) customers have been able to pay for taxi fares through their mobile phone using dash taxi. The scheme, which will be launched in partnership with payment provider Adaptis Solutions Ltd, promotes FCC’s continuing efforts to provide innovative technology and a safe and secure environment for its customers. Plans for a new footbridge to give people with wheelchairs, pushchairs and luggage easy access to St Neots railway station have come one step closer to fruition. First Capital Connect (FCC), Network Rail and Huntingdonshire District Council have developed an early outline design which they recently shared with local councillors and invited members of the public including representatives from the Loves Farm housing development, local police and commuters. The new east-west footbridge would be built just north of the station buildings and connect the new housing development at Loves Farm with the town centre via ramps and stairs. Stairs and lifts would connect the footbridge with the platforms below and the old footbridge would be taken down. Network Rail is designing the scheme to a remit developed with First Capital Connect, Huntingdonshire District Council and Gallagher Estates who are behind the Loves Farm development. The Department for Transport is part-funding the initiative through its Access For All scheme. The scheme will also include improved security through better CCTV and lighting and extra cycle parking. It is proposed that work starts on site in late spring 2013 and is completed in spring 2014. Alstom has signed a contract with Banedanmark - the Danish railway infrastructure owner - to deliver on-board equipment to railway operators in Denmark and equip 503 of their trains with Atlas ERTMS1 signalling solution. This contract worth €61 million is part of a framework agreement signed between Alstom and Banedanmark on 14 March 14, 2012. The former contract worth €140 million featured the deployment of Atlas on up to 789 trains operated by 41 operators on the Fjernbane Danish Network2. Atlas will enable Banedanmark as well as Danish operators, to increase their operational performances, improve traffic flow and optimize trains frequencies. ERTMS is a system for the management and control of the rail traffic on the lines of the Trans-European Networks. The ETCS3, one of the components of the ERTMS, is designed to enable trains to quickly cross borders, ensuring the safety of rail traffic. “Alstom is pleased to partner with Banedanmark and enable Danish operators to increase the fluidity and efficiency of their trains thanks to its latest train control technology" said Christian Algreen-Ussing, Alstom Denmark and Norway Representative and Customer Director. It will take about eight years to develop and deploy the Atlas solution on Danish railways, with two years dedicated on its design. During this phase, Alstom and Banedanmark teams will jointly work in Copenhagen (Denmark) in cooperation with Alstom’s teams based in the site of Charleroi (Belgium). The on-board ERTMS contract signed between Alstom and Banedanmark is part of a €2.4 billion programme decided by the Danish Parliament in January 2009 to renew the complete Danish Railways signalling by 2021. The full £9.4bn programme of improvements to the rail network published today will meet the needs of intercity passengers, commuters and freight up to the end of this decade while the Government continues to work on High Speed 2 to deliver rail capacity for the British economy in the decades to come. This High Level Output Specification (HLOS) programme for 2014-2019 was be discussed at today’s meeting of the Cabinet which the Prime Minister and Deputy Prime Minister in Birmingham. Crossrail, Thameslink, and electrification between London and Cardiff, Manchester to Liverpool and Preston, and across the Pennines, are among £5.2bn of projects already committed to during 2014-2019. * Upgrades to stations and tracks creating enough capacity around cities for an additional 140,000 daily rail commutes at peak times. In addition to Crossrail and Thameslink, announced previously, today’s enhancements include the £350m lengthening of platforms at London Waterloo station – providing capacity for 120,000 more daily commutes in and out of London and 20,100 extra daily commutes across Birmingham, Leeds, Manchester and other cities. * Faster journeys and more train capacity from £240m of improvements along the East Coast Main Line from the North East down through Yorkshire, Lincolnshire and Cambridgeshire to London. * The creation of a high-capacity “electric spine” running from Yorkshire and the West Midlands to South Coast ports of Southampton allowing more reliable electric trains to cut journey times and boost capacity for passengers and freight. This comprises an £800m electrification and upgrade from Sheffield – through Nottingham, Derby and Leicester – to Bedford, completing the full electrification of the Midland Main Line out of London St Pancras; and electrification of the lines from Nuneaton and Bedford to Oxford, Reading, Basingstoke and Southampton. * The landmark decision to take electric rail beyond Cardiff to Swansea, completing the full electrification of the Great Western Main Line out of London Paddington at a total cost of more than £600m, and electrifying the Welsh Valley lines, including Ebbw Vale, Maesteg and the Vale of Glamorgan. These will give two-thirds of the Welsh population access to new fleets of electric trains helping to generate Welsh jobs and growth by slashing journey times and boosting passenger and freight capacity. * Completion in full of the “Northern Hub” cluster of rail enhancements with the approval of £322m of outstanding track and capacity upgrades across Manchester city centre, Manchester Airport and across to Liverpool. These are in addition to £477m of Northern Hub schemes already approved across the North of England such as electrification of the North Trans Pennine route between York and Manchester. * A new £500m rail link between the Great Western Main Line and Heathrow allowing direct services to the airport for passengers from the West Country, the Thames Valley and Wales. The HLOS package will be funded in part from fare rises already announced in 2010 and also from the substantial efficiency savings which projects like electrification will have on the long term operating costs of the railways. Transport Secretary Justine Greening said: “Investment on this scale, in every region of the country, shows how this coalition government is focused on delivering an affordable, reliable and faster railway network that drives jobs and growth. The investment was also hailed by the Prime Minister, Deputy Prime Minister and Chancellor of the Exchequer. Deputy Prime Minister Nick Clegg said: “This is the biggest expansion in railways in over 150 years, with more than £9bn of investment across the country. Whilst we inherited a deficit greater than any in our nation’s peacetime history, we knew that we had to give the country the boost it needs, to build great railways and make journeys better for the millions of hard working people who use the train every day. The ‘Electric Spine’ will make a significant difference for passengers linking London, the Midlands and Yorkshire in a much more efficient rail line, connecting the South and North more effectively than ever before. Three projects to improve vital freight and passenger links on the railway network are to receive €14m (£11m) from the European Commission. €5m (£4m) to increase capacity and train lengths on the Southampton to West Coast main line route, and investing in new cranes at the port. The TEN-T Agency works to improve transport links across Europe, to increase economic and social growth. The Department for Transport apply to the agency each year for funding to improve the rail network, supported by Network Rail. The North West electrification project will see 25kv overhead power delivered to the routes between Liverpool and Manchester, Huyton to Wigan, Preston to Blackpool and Manchester to Preston via Bolton. The work complements the lines that are already electrified in the region – notably the key freight route of the West Coast Main Line, the busiest mixed use railway in Europe. The route from Southampton to the West Coast main line is being improved to offer gauge clearance for large 9ft 6 containers, longer loops to allow longer trains, and new cranes. The TEN-T money has been invested to increase train lengths. Felixstowe to Nuneaton is one of the UK’s busiest freight routes and the area around Ely is recognised as one of the major pinch-points. Installing the 775 metre freight loops will increase capacity, improve reliability and allow longer trains to be run. * It follows previous successful TEN-T bids worth €14m to improve other parts of the route. Network Rail has released new photographs from the air of many of its biggest projects in London which have undergone or are undergoing major redevelopments. They include views rarely seen by the general public of the stunning new concourse roof at King’s Cross, the development of Farringdon where Thameslink and Crossrail services will meet the tube, and the changes at Stratford in the shadow of the Olympic stadium. The newly completed Shard also looms large over London Bridge and Borough viaduct which is being redeveloped as part of the Thameslink project. Images taken last month were captured by the Network Rail helicopter which flies daily to monitor the network checking for faults or potential issues before they arise. Here it also enabled engineering and architectural teams on the London stations see project development from a unique perspective. King’s Cross: The new concourse is the size of three Olympic swimming pools. From the air you can see some of the 1,200 triangular panels which make up this new structure. Borough viaduct: A new viaduct, over Borough Market has been built providing an extra two tracks to unlock the bottleneck at London Bridge. This section of track will link into London Bridge station once it is complete. London Bridge: Is the country’s fourth busiest station and it is full. Today 50m passengers use the station a year. When completed, the redeveloped station will see more than 90m passengers travel through each year. Alstom has begun its dynamic test campaign on the Coradia Polyvalent - the latest addition to its range of regional trains. The tests are taking place at the Vélim test centre in the Czech Republic and, in France, at the Railway Testing Centres (CEF) at Valenciennes and Bar-le-Duc and on a section of the RFF line between Wissembourg and Hoffen. Approximately 50 engineers and specialist technicians from Alstom will be relayed on board ten pre-series Coradia Polyvalent trains until early 2013 in order to carry out the work needed to meet 3,000 contractual requirements. The certifications and approvals required to obtain the EPSF’s1 authorisation to operate will involve 10 regional trains undertaking a total of 1,400 days of testing and will directly or indirectly engage up to 200 people from 20 different bodies (Alstom's own sites, suppliers, test centres, drivers, etc.). The campaign will eventually generate 1,500 documents, including test specifications, procedures and reports. a 13 km circuit with a maximum authorised speed of 210 km/h. These test rings, which are electrified in accordance with European standards, make it possible to set up the Coradia Polyvalent's eclectic traction system in all power modes – diesel, 1500V and 25kV. The tests also help to qualify and certify the main functions of the train: electric or diesel braking and traction, air-operated braking system, noise emissions, acoustic comfort and electro-magnetic compatibility. At the same time, two Coradia Polyvalent trains have been undergoing comfort tests in diesel mode in France since May 22 on the section of line between the towns of Hoffen and Wissembourg. The test runs are operated at a maximum speed of 100 km/h and make it possible to set up the diesel traction system in different power-pack configurations2 , ranging from maximum power to degraded mode. The vibrations made by the train and its equipment are measured using sensors positioned along the entire length of the train. All the tests are carried out at night in order to avoid disrupting commercial traffic. In addition, validation tests are being carried out on six of the ten trains at the Valenciennes and Bar-le-Duc CEFs with the aim of configuring the Coradia Polyvalent's various instruments and functionalities (traction/braking). Finally, the certification trials will begin on the RFF3 tracks in July 2012. Nine sections of RFF4 track with specific configurations (bends, track quality, etc.) will host the Coradia Polyvalent trains. The tests are being carried out as part of the contract, financed by the French regions, signed on October 27, 2009 between Alstom and SNCF. The initial contract included a firm order of 800 million euros for the delivery of 100 Coradia Polyvalent trains. Up to now 171 trains in total have been ordered by the following French regions: Alsace, Aquitaine, Auvergne, Lower Normandy, Upper Normandy, Lorraine, Midi-Pyrénées, Pays de la Loire, Picardy, Poitou-Charentes and Provence-Alpes-Côte d’Azur. The framework contract should in time reach a volume of 1,000 trains for a total of more than seven billion euros. The delivery of the first of the 171 trains should take place in March 2013, with subsequent deliveries being staggered until mid-2015. 1 EPSF: French Railway Safety Authority (Etablissement Public de Sécurité Ferroviaire). 2 Power-pack: the power-pack supplies DC current to the traction chain from a diesel source; it may be likened to a generating set. 3 Réseau Ferré de France. 4 Aubrais-Vierzon (Centre), Epernay-Vitry Le François (Champagne), Toul-Culmont (Lorraine), Moûtiers-Bourg St Maurice (Rhône – Alpes), Caen-Cherbourg (Normandy), Plouaret (Brittany), Epernay-Meaux (Champagne), Tours-Les Aubrais (Centre) and Millau-Bédarieux (Midi-Pyrénées). The Coradia Polyvalent is a regional train with a high degree of modularity that offers several different types of technical configurations and passenger amenities. It can travel at a speed of 160 km/hr in electric or bi-mode version and at two voltages (25 kV and 1500 V). The Coradia Polyvalent is also available in a cross-border version that can operate on the German and Swiss networks at a voltage of 15 kV. Its low, integrated floor means that passengers can enjoy maximum accessibility and complete visibility for all-round added safety. The motor bogies positioned at the two ends of the train limit vibrations and sound levels. The Rail Accident Investigation Branch (RAIB) has released its report into an incident involving a runaway track maintenance trolley near Haslemere on 10 September 2011. At approximately 03.00 on Saturday 10 September 2011, a hand trolley which was being used by a track maintenance gang to transport small tools, ran unattended for a distance of 2.9 miles (4.6 km) along the Portsmouth main line near Haslemere. The incident occurred within an overnight engineering possession. The trolley reached an estimated maximum speed of 10.5 mph (16.8 km/h) and ran past a site where a gang had just finished rail grinding work in the path of the runaway trolley, before it stopped on an uphill gradient. There were no casualties. The RAIB investigation identified that the trolley operator did not know he was on a long falling gradient when he let go of the trolley and the brakes on the trolley failed to apply automatically (as designed). The brake mechanism probably jammed with the brakes in the ‘off’ position due to a combination of factors including inadequacies in the design and in the risk assessment and acceptance processes for trolleys to be used on Network Rail infrastructure, as well as inadequacies in the maintenance of the trolley. The RAIB investigation also identified that attempts to alert other members of staff to the runaway trolley were hampered by poor mobile phone reception in the area, and that the RAIB had previously made a relevant recommendation about trolley management in an investigation into a similar incident on London Underground infrastructure. Since the incident, Network Rail has withdrawn all of the trolleys of the type involved in the runaway from use on its infrastructure. It is also making use of the incident to reinforce its national initiatives to improve safety culture within the organisation. The maintainer of the trolley (Torrent Trackside) has taken steps to make sure that its fitters are properly supported and appropriately supervised. As a consequence of this incident, the RAIB has made five recommendations to Network Rail. These cover: the training and competence of trolley operators; the product acceptance process; reviewing actions it has taken since the incident; the need for alternative means of communication in areas of poor mobile phone reception; and the process for reviewing RAIB recommendations made to other operators. Network Rail has awarded VolkerRail, an operating company of VolkerWessels UK, a £15.5m contract for works at Acton freight yard, West London as part of the Crossrail programme. VolkerRail will be jointly delivering the contract to remodel Acton freight yard, with the rail division of sister company VolkerFitzpatrick. This work includes plain line track renewals, installation of new switches and crossings, associated switch operating mechanisms and modification to the overhead line system on the main line. These advanced works will be completed by early 2013, with the remaining programme of work for Acton, including a diveunder, due for completion in 2016. When Crossrail services begin in 2018, even more trains will travel along the Great Western main line so work is needed to improve capacity in the area. Acton freight yard is a significant part of the network and an important railway asset. However, to enter and leave the yard, trains currently need to cross main line passenger tracks. The plans for these modifications to the yard and a new diveunder, which is currently out for tender, will enable freight trains to leave the yard without affecting passenger trains and provide increased capacity for freight. Network Rail is responsible for the design, development and delivery of the parts of Crossrail that are on the existing network, covering 43 miles of track and 28 stations from Maidenhead in the west to Abbey Wood and Shenfield in the east. Rail Minister Theresa Villiers visited Basingstoke signalling centre on 11 July 2012 to meet staff from the South West Trains/Network Rail alliance. The signalling centre is responsible for controlling the movement of almost 600 passenger and freight trains, every day. It controls the strategic junction on the South West main line from London at Basingstoke with the key routes linking the West of England and Southampton to the Midlands. The alliance was formed in April to create one management team responsible for both trains and track in the south and south-west of England with the objective of delivering better rail services for passengers. Rail Minister Theresa Villiers said: “The Wessex Alliance represents industry rising to the challenge of the Government's rail command paper, issued in March 2012, which called for closer co-operation between operations and infrastructure. Basingstoke is a really impressive example how on a practical level the creation of one management team can work to deliver a more efficient and a better railway with real benefits for both passengers and freight customers and the community in general." Rail passengers can now buy their train tickets via their mobile phones using the enhanced mobile version of the South West Trains website. The updated version of the mobile website allows passengers to purchase tickets and receive tailored information on their journeys while on the move. Tickets can be bought quickly and easily through the South West Trains mobile website and then collected from one of a thousand stations across the south of England. South West Trains has responded to increasing demand from customers by revamping the design, content and functionality of its mobile website to make it even easier for passengers to book their tickets on the move. with any disruption on their route. Providing real time disruption information and live departure and arrival boards to customers via their mobile phone, the new Journey Check Mobile facility is a mobile phone friendly view of South West Trains’ Journey Check. It provides real time updates on arrivals and departures, route disruption, delays, catering updates and Journey Check Alerts registration. Using Journey Check Mobile, customers can now select the train service they are interested in and see the calling pattern of that service, the expected time of arrival and the platform number where it is available. This development comes just weeks after parent company Stagecoach Group announced plans to transform the way consumers use tickets to travel on public transport by partnering with the UK’s biggest communications company, Everything Everywhere. The two companies have unveiled a trial of the UK’s first Government-standard commercial deployment of mobile contactless transport ticketing which is already underway on the Stagecoach bus network in Cambridgeshire and allows a small cross section of bus users to receive, store and validate their bus tickets using their mobile phone. Volunteer gardeners have planted colourful floral displays at Aberdeen station as part of a ScotRail community project. Aberdeen in Bloom has installed three classic Edwardian-style tiered planters, supplied by Aberdeen City Council, as part of ScotRail’s Adopt a Station scheme. It brings the total number of ‘adopted’ stations in north-east Scotland to 11 – with volunteer gardeners tending to floral displays at Aberdeen, Dyce, Forres, Huntly, Insch, Inverurie, Keith, Laurencekirk, Montrose, Portlethen, and Stonehaven. The Kingsway Tram Tunnel in Holborn, a unique part of London’s transport history, will be temporarily re-used for Crossrail. Crossrail’s western tunnels contractor, BFK, is making use of the historic subway, closed since 1952, to build an 8 metre deep, 5 metre wide, grout shaft below the floor of the tunnel. Grout shafts allow engineers to pump grout (a cement-like substance) deep into the ground to firm it. This will protect nearby buildings from any potential ground movement when Crossrail’s tunnel boring machines reach the area in 2013. Passengers in Workington can now see the level of investment being made at their local station as a £200,000 refurbishment scheme is completed. Local MP Sir Tony Cunningham officially cut the ribbon on the station improvements and was joined by members of the Cumbrian Coast Community Rail Partnership and Northern Rail. Work has included refurbishing the booking hall and the waiting room on platform two, as well as additional seating and providing a new accessible ticket counter. A public announcement system has also been installed throughout the station. The project has been funded by the Department for Transport’s National Station Improvement Programme, delivered in partnership by Northern Rail and Network Rail. Southeastern honoured four- time Paralympic gold medallist, Marc Woods on 10 July 2012 by officially naming Class 395 Javelin® train No. 395026 after the prominent swimmer. The former Paralympian, European and World Champion is an ambassador for the London 2012 Games. Charles Horton, managing director for Southeastern said: “Marc Woods in his 17 years as a professional athlete won 12 Paralympic medals from five Games, and won gold four times. His contribution to the world of sport and his role as Ambassador for the London 2012 Games is an inspiration to us all and we’re proud of our association with Marc. As we approach the final countdown for the launch of the Javelin® service, it is only fitting that we recognise Marc’s incredible achievements and his work with Southeastern by naming a Javelin® train in his honour,” Mr Horton said. 12 of the 29 Javelin trains have been formally named. The first ever unit was named after Dame Kelly Holmes, who won two gold medals for her running in the 2004 Olympic Games. Charles Horton added: “We’ve been working closely in partnership with LOCOG, the ODA, the Department for Transport, Network Rail, Transport for London and High Speed 1 to plan our service for what many call the greatest show on earth. We are expecting our services to be very busy during the Games, but we are well prepared. We are advising our passengers to plan their travel ahead, and to visit getaheadofthegames.com to see how their journey might be affected,” he said. 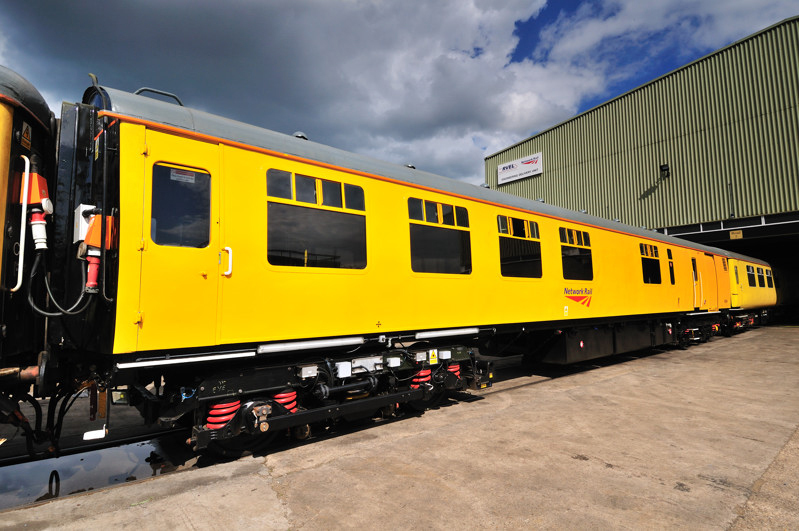 Southeastern will operate the Javelin® service during the London 2012 Games. The first Javelin® service will commence on Friday 27 July. The Javelin® is by far the fastest way to the Olympic Park from Central London; providing up to 12 trains an hour at peak times and transporting 25,000 people to and from St Pancras International and Stratford every hour in just seven minutes. The service is expected to be very busy during the Games and special queuing arrangements will be in place. With the summer rush not far away, Newquay station presents a smarter face to visitors thanks to investment from Network Rail. In a £450,000 project, the former station canopies have been completely replaced with a light and airy modern structure, covering the café and travel centre and providing shelter in the previously-uncovered centre of the concourse. Network Rail contractors Murphy’s have also replaced the cracked and worn paving slabs on the concourse with fresh tarmac and installed new lighting. A further £200,000 has been spent relaying the surface of the long platform, complete with tactile paving, ready to welcome the thousands of passengers who travel to Newquay from across the country every year. Network Rail, the owner and operator of Britain’s railway infrastructure, has launched an international rail consultancy business. Network Rail Consulting will harness the vast range of skills and experience available within Network Rail to demonstrate British expertise overseas and be an international ambassador for Britain’s rail industry. It will also help channel innovation back into Network Rail’s core business, helping deliver a better value railway for Britain. The move is part of a wider reform agenda at Network Rail, which has seen the company move towards a devolved group structure to drive further efficiencies and demonstrate value through market competition. Network Rail Consulting intends to form strategic alliances with two major international consultancies to pursue opportunities in its target markets, working with CH2M HILL and Atkins. The geographic focus of Network Rail Consulting centres on those countries, such as the USA and India, with large, aging rail infrastructure in need of modernisation – an area in which Network Rail has vast experience. In addition, there will also be opportunities to team with other consultants elsewhere. Markets where Network Rail Consulting would be able to carry out work as sub-consultant to alliance partners include Brazil, northern Europe, the Middle East, the Far East and Australia. Network Rail is installing spoken warning equipment at 63 level crossings across the country, alerting pedestrians and motorists that while one train has passed through that another train is coming from the other direction. It is hoped that these clearer instructions will reduce the risk of someone mistakenly believing that it is safe to cross after the first train has passed. The first few are being rolled out this week across the London North East route near York at Hunmanby Station, Nether Lane, Nafferton, Cranswick and Arram level crossings and near Selby at Wressle and Eastrington. Currently these crossings have a two-tone yodel, where the second sound is a more high pitched tone and frequency, warning those waiting that a second train is approaching from the opposite direction. However, research by RSSB, the industry safety body, has suggested that voice messages mixed with the standard tones are more likely to be understood and obeyed. The new alarm now says “warning, another train is approaching”. The spoken alarms will also be set to a lower volume at night so, whilst still audible, reduce the impact on anyone living or working near by. This technology is follows on from a successful trial at Scarrington level crossing in the East Midlands. Network Rail also has plans to install the technology to other crossings that do not have any audible alarm to enhance the safety warnings at these locations. This work is part of Network Rail’s £130m investment in reducing the risk at level crossings across Britain over the next couple of years. Other work includes closing more than 500 crossings since 2010, building footbridges to replace footpaths and rolling out 10 more level crossing enforcement vans to deter people from jumping the lights. London Underground’s Farringdon station is the 66th Tube station to become step-free from street to platform level, as London prepares to welcome millions of additional passengers on the network for the Olympic and Paralympic Games. Five new lifts have been installed to provide direct access to all four platforms at the station both for wheelchair users and passengers with heavy luggage and buggies. The new lifts follow the opening of a brand new ticket hall in December 2011 and are the latest in a raft of improvements at Farringdon, part of a Network Rail redevelopment that has transformed the entire station. Network Rail improvements have also provided 36 new ticket gates, 20 new staircases, one new footbridge, two new ticket offices and nine new ticket machines spread over the newly restored original entrance and two brand new entrances. Customers using the station will also have benefited from the new eight car air-conditioned Tube trains that are now operating on the Metropolitan line. A new fully walk-through train which allows better access for customers has begun to run between Hammersmith and Moorgate as a preview service. These seven car trains, which when delivered will form a total fleet of 191, will eventually roll out on the Circle, District and Hammersmith & City lines. The Rail Accident Investigation Branch (RAIB) has released its report into the incident at Warren Street station, on the Victoria Line of London Underground on 11 July 2011. At 17.29 hrs on 11 July 2011, a loaded passenger train, consisting of new Victoria Line tube stock, started from Warren Street with all the passenger doors on the platform side open. No-one was hurt in the incident. When the train reached 8 km/h, a safety system on the train closed the doors, but not before the train had entered the tunnel with the leading set of doors open. The train is fitted with sensitive edge doors designed to apply the brakes if a thin object trapped by the doors is detected. The sensitive edge system was activated by the strap of a passenger’s bag when the train was stopped at the previous station, Oxford Circus. the train operator was in a growing state of confusion as a result of the activated sensitive edge system which he was unable to reset. The RAIB investigation identified: that a recent modification to allow train operators to override an activated sensitive edge system had changed the operation of an indication light, which probably misled the train operator. The potential source of confusion had not been identified during the design and testing of the modification; and that the train operator lacked the competence to deal effectively with non-routine situations. Although raised as a possible issue during initial selection as a train operator, this deficiency was not identified during subsequent training. a review of the guidance and instructions, and information provided by the train control management system, to train operators relating to resolving activated sensitive edge systems; the process of managing engineering change; the competence management of train operators; and the requesting of operational and technical support by train operators when having difficultly dealing with out-of-course events. Network Rail has launched its fourth ultrasonic rail testing train into service, complete with ground penetrating radar, ultrasonics and rail profile laser scanner. The company’s test trains use ultrasonic equipment – the same technology used in medical situations – to detect minute flaws in the track. With the original three units being used at their full capacity to keep the track compliant, the addition of a fourth means one can be taken out of use for servicing, making the service more resilient and flexible. The new train, or UTU 1 as it is known, has more accurate positioning systems and an improved ability to test the track. It can also be used at a higher speed, an important part of Network Rail’s plans for maintaining the network. The UTU’s rail profile scanner uses laser technology to compare the state of the railhead with a pre-programmed template to judge if the track is becoming worn out of shape, and in need of grinding. The Network Rail UTU trains do not replace traditional track walks by permanent way staff – although they do reduce the need for them. Instead, they direct the focus of track walks to areas needing inspection, saving time and money, and increasing the safety of the network. Nexus, which owns, manages and is modernising the Newcastle Metro, is starting work this week on the replacement of the passenger lifts at Heworth and Four Lane Ends interchanges. The work will see the passenger lift cars replaced with brighter, cleaner, quieter and more energy efficient technology. The work will be carried out in phases so that both of the interchanges will always have at least one passenger lift in operation. Nexus owns and manages the Heworth Interchange in Gateshead and the Four Lane Ends Interchange in North Tyneside. The lifts on platform one at both interchanges will be out of action from this week until September. The respective lifts that serve platform two will be replaced between September and November. Monument and Central Metro stations in Newcastle city centre are both set to undergo escalator replacement work in the coming months. A total of eight new escalators are being installed with the work scheduled for completion in March 2013. Chiltern Railways is adding carriages to its trains for music lovers heading to Global Gathering on 27 and 28 July 2012. The festival is taking place at Long Marston Airfield in Warwickshire. There will be additional carriages on the 09.10, 10.40, 12.40 and 15.10 services from London Marylebone to Stratford-Upon-Avon on both days. A shuttle train service will also run from Leamington Spa to Stratford-Upon-Avon at 11.32, 13.32, 15.32 and 17.27 for festival goers. The annual dance festival, which is in its 12th year, has taken place in countries from as far afield as Australia to Ukraine, attracting music lovers from across the globe. ScotRail has installed a touch-screen machine at Aberdeen station to speed up ticket collection for customers. Aberdeen was chosen as the first station to trial the fast ticket-printing machine as it issues more than 11,000 Tickets on Departure a month – more than any other station in Scotland. The easy-to-use machine, known as a ‘ToDler’, will be trialled for six months. The machine checks customers’ credit card details before printing tickets at up to three times the speed of conventional ticket vending machines. The most significant stage in a major project to improve services on one of Britain’s major rail routes took place over the weekend of 30 June - 1 July 2012, as the main span of a new rail overbridge was lifted into place. The Hitchin flyover will see trains for the line to Cambridge and Ely leave the East Coast Main Line on a new stretch of railway, avoiding the current flat junction just north of the town’s station. They will then cross the existing main line on a bridge and rejoin the old Cambridge route almost a mile to the east of the town. Network Rail succeeded in lifting the 300 tonne main span of this bridge into position early on Sunday morning, using a 1200-tonne crane for the purpose. Despite the weight and delicacy of the operation, it took just an hour and a half to drop the span and bolt it into place. Network Rail's route managing director Phil Verster said: "The Hitchin flyover will make a real difference to passengers who travel on the East Coast Main Line, as well as people travelling to Cambridge and beyond. Trains will run more reliably and punctually, and we will have cleared one of the major bottlenecks on the route. Lifting the main span into place is a milestone in the project and a sign that we are on track to deliver those benefits." Today, trains travelling from London King’s Cross have to cross three other lines to switch between the East Coast Main Line and the line to Cambridge. This reduces capacity for other services and makes the railway less reliable when delays occur. The new rail link will avoid these problems completely, cutting delays to train services by nearly 30,000 minutes every year and helping create the capacity to run more services when future timetables are developed. The total cost of the project, from the very earliest stages on the drawing board to completion, is expected to be £47m. Passengers can expect to travel on the new stretch of line by early 2014. Telford & Wrekin Council's cabinet has approved the appointment of Europe's largest rail freight company as the new operator of the town's International Railfreight Park. DB Schenker Rail has been appointed through formal EU procurement after Telford & Wrekin Council consulted with railfreight industry experts on the best way forward for the terminal. DB Schenker Rail has offered to operate the terminal and will pay connection charge, rates and operating costs. The company will market the terminal in order to increase volumes using the facility while DB Schenker Rail's traffic from the continent, which is normally hauled by road after it terminates at an international rail terminal, could be diverted to the Telford International Railfreight Park. Councillor Charles Smith, cabinet member for Housing, Regeneration and Economic Development, said: "DB Schenker Rail's appointment is a fantastic shot in the arm for the local business economy and we are delighted that they are committed to investing in Telford. This is the appointment of a major company to take the facility forward and is just one more example of Telford & Wrekin Council working co-operatively to kickstart the local economy. I look forward to the facility being used a lot more in the years to come as DB Schenker Rail develops a strategy that enables major local businesses to use the terminal effectively." David Legge, Business Manager Logistics for DB Schenker Rail UK, said: "Terminals are crucial for the development of rail freight services, and the facility at Telford is a unique opportunity to increase volumes moved by rail rather than road. DB Schenker Rail is proud to have been awarded the contract to operate and manage the terminal and by working with Telford & Wrekin Council we aim to make it a success. We will integrate the terminal at Telford into our existing terminal network throughout the UK, in order to maximise growth in volumes handled at the facility." Telford International Railfreight Park was opened in June 2009 and can load or unload up to four freight trains a day. It was funded by a combination of Telford & Wrekin Council, Advantage West Midlands, the Homes and Communities Agency and the European Regional Development Fund. DB Schenker Rail's appointment was confirmed by Telford & Wrekin Council's cabinet in a closed session debate on Thursday night. DP World London Gateway and DB Schenker Rail have jointly announced an agreement to provide rail services from day one at the new deep-sea port and Europe's largest logistics park, which opens in Q4 2013. DB Schenker Rail will operate freight trains over 700 metres in length from London Gateway, amongst the longest in the UK. The new hub is likely to become the UK's busiest rail freight terminal. The agreement will see DB Schenker Rail introduce at least four rail freight services a day (four in, four out), subject to volumes, and will serve a range of inland terminals including potential new UK locations. Additional rail freight services will be introduced in the future. DB Schenker Rail will also pursue the development of rail freight services from London Gateway to mainland Europe using the Channel Tunnel. Carsten Hinne, Managing Director Logistics for DB Schenker Rail UK, said: "London Gateway is the most significant logistics project in the intermodal sector, and it will be home to the largest rail freight terminal in the UK. The services which we will launch at London Gateway will be the first of many freight trains that we will operate from the port, forming a strong rail freight network across the UK and mainland Europe for customers. In addition, DB Schenker is a truly multimodal operator using shipping, air, rail and land to deliver our services. The wider DB Schenker group is pursuing a range of shipping line options for its international clients through London Gateway, in the anticipation that they can have containers handled through the port during late 2013." DB Schenker Rail is committed to providing the rail freight capacity required to maximise volumes being transported by rail to and from the port. The trains will avoid over 4,000 lorry movements per week from the nation's roads making the future of logistics in the UK more sustainable. Simon Moore, Chief Executive Officer for DP World London Gateway, said: "We are delighted to announce this agreement with DB Schenker Rail. Rail freight services to and from London Gateway will provide a reliable, easy and efficient movement of goods between the port and the major population centres in the UK, while reducing the carbon footprint for cargo owners. We believe rail will be more competitive from London Gateway than any other UK port destination. The commitment of DB Schenker Rail to provide a range of rail freight services for London Gateway users ensures that we will have world class connections from day one of operations." Rail technology leader Bombardier Transportation announced on 5 July 2012 that it has signed a Technology Licence Agreement with CSR Puzhen, a subsidiary of the largest player in the railway manufacturing sector in China – China South Locomotive & Rolling Stock Corporation Ltd (CSR). Under the agreement, Bombardier provides CSR Puzhen with a 10-year licence to manufacture and sell 100 per cent low-floor trams with Bombardier technology in China (including Hong Kong and Macao). The licensed product is a variant of the BOMBARDIER FLEXITY 2 platform of vehicles already operating in Blackpool, UK and being delivered to the Gold Coast, Australia. The agreement covers the preparation and delivery of documentation of the licensed product as well as training and assistance for CSR Puzhen’s employees to understand the documentation and enable them to successfully manufacture and sell the licensed product. Bombardier will not actively build vehicles in China, but comprehensively support its new Chinese partner. The vehicles will be equipped with the innovative BOMBARDIER FLEXX Urban 3000 bogies and the BOMBARDIER MITRAC 500 propulsion and control system. After recent significant achievements in China’s high speed train, locomotive, signaling and metro segments, Bombardier Transportation is now entering the tram market in China through a co-operation with CSR Puzhen. This move supports Bombardier’s strategic drive to grow strong “local roots” in key markets. “After many years of intense development of metros, Chinese cities are embracing low-floor trams to complement their urban transit systems. Bombardier is now bringing its state-of-the-art technology to this new and growing market,” said Jianwei Zhang, President of Bombardier China. Germar Wacker, President Light Rail Vehicles, Bombardier Transportation, added: “Our FLEXITY trams combine market-leading experience, proven parts and visionary engineering. We are proud to take this vehicle family to China. This will ensure that passengers in China can enjoy the highest standards in comfort and safety. By providing efficient and ecological transport solutions, Bombardier’s FLEXITY trams shape the identities of modern cities across the globe.” As the market leader in the tram and light rail vehicle (LRV) segment, Bombardier and its FLEXITY family offer modern mobility solutions to meet the requirements of any city. The most comprehensive portfolio of the industry ranges from 100 per cent low-floor trams and 70 per cent low-floor trams and LRVs to proven dual system solutions. More than 1,700 FLEXITY trams are already in successful revenue service, and Bombardier has sold more than 1,000 FLEXITY 100 per cent low-floor trams to date. A total of 3,500 trams and light rail vehicles from Bombardier are on order or operating in nearly 100 cities in more than 20 countries around the globe. Visitors to InnoTrans 2012 can experience the FLEXITY 2 tram, which Bombardier plans to display at the trade show in September in Berlin, Germany. The new system, called IBM Maximo, will provide more visible and readily-available maintenance and defect information through a windows-based platform that is easier to use and replaces current legacy systems RAVERS and IMACS that date back to the pre-privatisation British Rail era. Maximo forms a crucial part of East Coast’s “Project Eagle”, an initiative which aims to improve the management and control of engineering processes. It will complement East Coast’s web-based on-train remote control monitoring system, called Falcon. This provides information on locomotive conditioning and gives advance warning of train component failures ahead of actual faults occurring, thereby improving performance and leading to more reliable services for passengers. The Maximo system will provide a broad basis for all of East Coast’s train maintenance support functions, as well as offering a more cost-effective and efficient maintenance regime. It will ensure that optimum stock levels are maintained, warranty claims are managed, and access to vehicle maintenance history records and performance are improved, thereby supporting a regime where East Coast engineers are preventing faults rather than reacting to them. The new system will be installed and tested at East Coast’s maintenance depots at Bounds Green, in London, and Craigentinny, in Edinburgh, over the coming months. Training will be provided to East Coast’s engineering team, who will be use the system every day, and to industry partners, including the maintenance teams at Neville Hill, Heaton and Polmodie, as well as Wabtec, Unipart Rail, and Rolling Stock Owning Companies. Vetasi were chosen from the five bidders invited to tender for the contract back in January, from a total of 37 companies who initially expressed an interest. Amey Railways has added to its significant level crossings portfolio, after being appointed by Network Rail to deliver two modernisation schemes in Devon. Amey will upgrade the existing CCTV controlled level crossings at Red Cow at Exeter St David’s Station, and at Pinhoe Station in Exeter. This will involve renewing the existing barriers, operating equipment and signalling controls at both crossings. Red Cow level crossing is situated on a busy route adjoining a complex road junction at the London end of Exeter St David’s station. To minimise disruption, Amey will keep the crossing open throughout the works to maintain traffic flow. The works are planned to be completed in time for commissioning over the Christmas holiday. At Pinhoe, traffic will be diverted around the site for two weeks, while teams install new equipment. Amey will be working closely with Network Rail and several local authorities on both schemes to minimise the impact of the works on the community. Amey is also investigating the possibilities of replacing the present copper-based signalling cables with new fibre optic cables which will improve reliability, as well as remove the need for expensive and scarce copper resources. Fibre optic cables will also remove the potential risk of theft. All materials being used for the new contracts will be securely stored or not kept on site in order to deter thieves. Rail passengers on South West Trains, one of the busiest commuter networks in Europe, are to benefit from a multi-million-pound investment in Wi-Fi technology over the next 12 months. The £3.2 million project is being introduced by the South West Trains-Network Rail alliance and leading train manufacturer Siemens. South West Trains' fleet of 45 Class 444 Desiro trains will be fitted with the technology, which will allow passengers to access websites and email on the move. The trains operate on the mainline service from London Waterloo via Basingstoke, Southampton and Bournemouth to Weymouth, used by 15 million passengers a year. New external cameras are also being installed on the 444 Desiro fleet, which will use the Wi-Fi technology to assist with track and conductor rail maintenance and monitoring to help improve punctuality. Within two years, the initiatives could provide a platform to deliver a sophisticated rail traffic management system on the South West Trains network to allow more trains to run in and out of London Waterloo. Nearly 1,700 trains already run in and out of Britain's busiest railway station every week day and more than 200 million journeys are made on South West Trains every year. The new engineering investment programme is the latest initiative by the South West Trains-Network Rail alliance, which was launched in April 2012 to improve services for customers, cut delays and deliver a more efficient railway. It also follows a £15 million investment by South West Trains in the past two years in pioneering engineering developments on its Desiro fleets to deliver better train performance for passengers. South West Trains was the first UK train operator to use state-of-the-art track ‘listening’ technology, RailBAM®, and to introduce track-friendly hydraulic bushes which help reduce infrastructure damage. RailBAM® is acoustic monitoring technology, which employs sensitive microphones mounted at the side of the track to listen to every individual axle bearing on each train as it passes. It can detect axle defects or deterioration which can then be addressed more quickly. Hydraulic bushes wheel technology significantly reduces track damage, cuts infrastructure maintenance costs and provides smoother journeys for passengers. The innovative engineering design – which combines conventional elastomer bushes with a hydraulic system – reduces the force between the wheel and the rail, ensuring better movement on curved track at low speeds. South West Trains has also introduced coupler heating, which prevents ice forming on the coupler and reduces service disruption caused by freezing weather conditions. Earlier this year, South West Trains has completed a £2.2m investment programme to fit regenerative braking technology to more than 200 electric trains. It captures energy previously lost and returns electricity to the third rail system, allowing trains in close proximity to draw on the supply. The energy saved annually is enough to power more than 11,500 UK homes. Easy-to-read LED display screens are being installed at 19 ScotRail stations this year. The upgraded customer information displays – featuring orange-on-black text – are replacing conventional ‘tv-style’ cathode ray tube screens. The LED screens are being installed at Barrhead, Broughty Ferry, Camelon, Croy, Dunfermline Town, Falkirk Grahamston, Falkirk High, Kirkcaldy, Leuchars, Linlithgow, Musselburgh, Polmont, Rutherglen and West Calder, Cumbernauld, Dunblane, Glasgow Central Low Level, Lanark, and Mount Florida. More than £400,000 is being invested in the screens – with funding from ScotRail, Network Rail and Transport Scotland’s Access for All Small Schemes programme. Tactran has supported the Broughty Ferry improvements. Transport Minister Keith Brown said: "Providing passengers with live travel information is a key element of the efficient, passenger-focused railway that this Government is striving for, so I welcome the news that so many local stations are being fitted with these screens. I am particularly pleased to see modern technology being used to help passengers with impaired vision, as improving access to stations and passenger services for people with disabilities is a top priority." Train operator Greater Anglia is playing a pivotal role in building the case for regional rail investment in East Anglia. The company owned by Dutch operator Abellio which took over the main regional franchise in February, has been helping to coordinate and draft a new prospectus which sets out the case for greater investment in the region's rail network. Greater Anglia welcomed the launch of the prospectus on Monday 2 July 2012 by an influential and extensive alliance of MPs, local authorities, Local Enterprise Partnerships and Chambers of Commerce, highlighting the economic case for investment and key priorities for the remainder of this decade, as well as a 20 year vision. Greater Anglia is offering customers the chance to sign up for a free ‘JourneyCheck’ text alert service providing real time train service information. The new sms text service will enable customers to receive up-to-the-minute information about the train services on their regular route. This free text service will complement a comprehensive range of real time information which Greater Anglia is providing for their customers, including the twitter feed, which now has over 7,000 followers; demonstrating the train operators commitment to improve information provision for their customers. To register for the new text service customers just need to visit: www.journeycheck.com/greateranglia where they will be able to set up alerts for their regular journey and will receive messages, alerting them to any service alterations which may affect them. It is also possible to receive these free service updates via e-mail too, should customers prefer this.